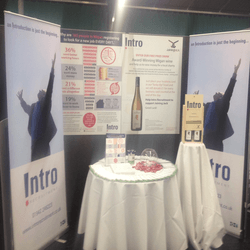 The Intro Team were one of 150 companies who attended this year’s Wigan Business Expo held at Robin Park. Not having participated in previous years, we were unsure as to what to expect. However, the day was a huge success! All available space was occupied which achieved a vibrant and exciting atmosphere. Interesting seminars, and lots of networking opportunities with other local businesses were available. A big “thank you” to all 67 companies who placed their business cards in our “Joining Jack” lucky dip bowl with Intro pledging to donate £1 for every business card in the bowl at the end of the day. We’re pleased to say that McCarthy, Bennet, Holland were the winners and hope they enjoyed the two fabulous bottles of Peter Lehmann’s Wigan Riesling - Cheers! Intro have topped up the sponsorship to make a total of £100 and will be presenting this to our very own Wigan charity “Joining Jack”. Thanks also to the organisers of Expo 2016 - we’ll definitely be back next year!